Description: Sold in 2 packs. Stealth Tackle, 180 lb fluorocarbon leaders offer maximum strength and abrasion protection while as "invisible" as any other fluorocarbon leader. The fluorocarbon, used by Stealth Tackle is a carbon based resin widely used in fishing line for large salt water game fish that offers high abrasion resistance, superior tensile and knot strength as well as the invisibility factor that fluorocarbon provides. Stealth Tackle leader components are made up of 150 lb ball bearing swivels to prevent line twist, the strongest snaps available, and #5 String Ease Stay-Lok snaps. 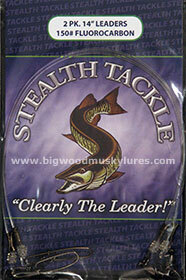 stealth Tackle leaders are nail knotted with the tag ends crimped and super glued to offer added insurance and safety. 180 lb test, 14" 2 pack. Description: Sold in 2 packs. 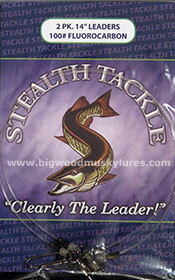 With Stealth Tackle, 150 lb test fluorocarbon leaders, you get a super strong leader with near invisibility. The fluorocarbon, used by Stealth Tackle is a carbon based resin widely used in fishing line for large salt water game fish that offers high abrasion resistance, superior tensile and knot strength as well as the invisibility factor that fluorocarbon provides. Stealth Tackle leader components are made up of 150 lb ball bearing swivels to prevent line twist, the strongest snaps available, and #5 String Ease Stay-Lok snaps. stealth Tackle leaders are nail knotted with the tag ends crimped and super glued to offer added insurance and safety. 150 lb test, 14" 2 pack. Description: Sold in 2 packs. Stealth Tackle, 130 lb fluorocarbon leaders are made of the finest quality materials and components on the market today. The fluorocarbon, used by Stealth Tackle is a carbon based resin widely used in fishing line for large salt water game fish that offers high abrasion resistance, superior tensile and knot strength as well as the invisibility factor that fluorocarbon provides. Stealth Tackle leader components are made up of 150 lb ball bearing swivels to prevent line twist, the strongest snaps available, and #5 String Ease Stay-Lok snaps. 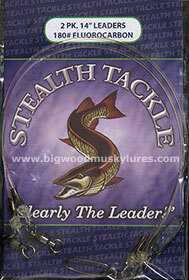 stealth Tackle leaders are nail knotted with the tag ends crimped and super glued to offer added insurance and safety. 130 lb test, 14" 2 pack. Description: Sold in 2 packs. Stealth Tackle, 100 lb fluorocarbon leaders are made of the finest quality material and components on the market today. The fluorocarbon, used by Stealth Tackle is a carbon based resin widely used in fishing line for large salt water game fish that offers high abrasion resistance, superior tensile and knot strength as well as the invisibility factor that fluorocarbon provides. Stealth Tackle leader components are made up of 150 lb ball bearing swivels to prevent line twist, the strongest snaps available, and #5 String Ease Stay-Lok snaps. 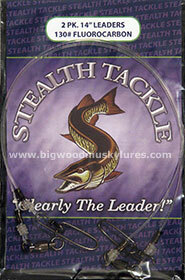 stealth Tackle leaders are nail knotted with the tag ends crimped and super glued to offer added insurance and safety. 100 lb test, 14" 2 pack.